As of April 08 2013 there were about 8,039 single family and condo homes listed for sale in Portland Oregon. The median asking price of these homes was approximately $274,000. Since this time last year, the inventory of homes for sale has decreased by 24.4% and the median price has increased by 9.6%. The median asking price for homes in Portland peaked in April 2007 at $354,740 and is now $82,790 (23.3%) lower. From a low of $239,125 in February 2011, the median asking price in Portland has increased by $32,825 (13.7%). Housing inventory in Portland, which is typically highest in the spring/summer and lowest in the fall/winter, peaked at 23,354 in July 2008. The lowest housing inventory level seen was 7,938 in April 2013. This past week, several reports were released, all of which showed that declining home inventory is affecting sales. This decline is creating a seller’s market in which multiple bids are being made to purchase homes. According to the National Association of Realtors, existing home sales fell 1% in December, but were still at the second highest level since November, 2009. Inventory of homes for sale fell 8.5 from November, the lowest level since January of 2001, and are down 21.6% from December of 2011. Following that lead, pending home sales dropped 4.34% in December to 101.7 from 106.3 in November, yet was 6.9% higher than December, 2011, according to the National Association of Realtors. The Chief Economist at NAR stated that “supplies of homes costing less than $100,000 are tight in much of the country, especially in the West, so first time buyers have fewer options”. Mortgage ratesare still low, affordability is still there, but the available homes are dwindling. In the meantime, home prices are increasing at a faster pace. According to the latest S&P/Case-Shiller index for November, property values rose 5.5% from November of 2011 which was the highest year over year increase since August of 2006. The cause of the low inventory can be attributed to several factors. For the week ending January 18th, loan applications increased 7.0% on a seasonally adjusted basis, according to the Mortgage Banker’s Association. The Refinance Index rose 8% with refinances representing 82% of all applications. The seasonally adjusted Purchase Index rose 3%, the highest level since May, 2010. Many homeowners have chosen a mortgage refinance instead of moving to another home which is one reason that inventory is down. In addition, many underwater homeowners have refinanced through the HARP program which is available for loans that were sold to Fannie Mae or Freddie Mac prior to June 1, 2009. These homeowners may not yet be in a position to sell their homes until they have gained back enough equity. As home prices increase, this will eventually happen. The same can be said for those who refinanced through the FHA streamline program which is offering reduced fees for loans that were endorsed prior to June 1, 2009. Refinancing through these two government programs, both available until the end of 2013, hit all time highs in 2012. Home builders are busy, but not currently building new homes at the rate that was seen during the housing boom. According to the Census Bureau and the Department of Housing and Urban Development, total new homes sales in 2012 hit the highest level seen since 2009 and were up 19.9% from 2011. There was much progress made in 2012, but sales for new homes fell 7.3% in December. On the down side, the Census Bureau reported that homeownership fell 0.6% to 65.4% during December, down from 65.5% at the end of October and 66% at the end of 2011. Homeownership reached a peak of 69.2% in 2004 and has been falling since that time. The latest Consumer Confidence index dropped to 58.6 which is the weakest since November of 2011. It was previously at a revised 66.7 in December. This fell more than expected and is due to the higher payroll tax that is taking more out of the pockets of consumers. 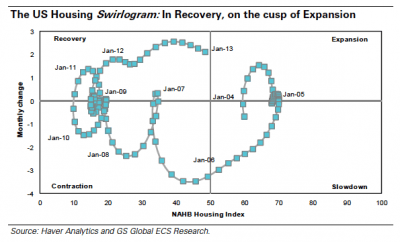 The housing market, which is still in recovery, remains fragile. The lack of inventory and the rise of home prices may affect its progress this year. As home prices increase, fewer consumers will be able to qualify for a home loan. Existing homeowners may choose to refinance remain where they are instead of purchasing another home. While jobless claims have fallen, there are still many consumers who are out of work or are working lower paid jobs. The housing market is dependent on jobs, not just for salaries, but for consumer movement from one area to another. FreeRateUpdate.com surveys more than two dozen wholesale and direct lenders’ rate sheets to determine the most accurate mortgage rates available to well qualified consumers at about a 1 point origination fee.